There are many one-way streets in this area. 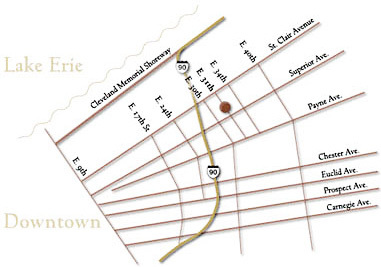 We are located between St. Clair and Superior Avenues on East 31st Street. We do not post our business name on our building. We do, however, have “1420” signs posted on the fences that surround our building. Give us a call if you’re lost. 216.566.7950. I-90 East towards Cleveland, to Superior Avenue Exit. Turn right on Superior. Pass through the first intersection, which is East 30th. Turn left at the very next street, which is East 31st Street. Turn left on Buck Court, then make an immediate right into the parking lot. If you get to St. Clair, you have gone too far. I-271 to I-480 West to I-77 North to Cleveland. Follow signs to 90East/E. 9th Street exit. Stay left and follow signs to 90 East. Exit on Superior Avenue. Turn right onto Superior. Pass through the first intersection, which is East 30th. Turn left at the very next street, which is East 31st Street. Turn left on Buck Court, then make an immediate right into the parking lot. If you get to St. Clair, you have gone too far. I-90 West around Dead Man’s Curve, exit at Superior Avenue. Turn left on Superior. Pass through the first intersection, which is East 30th. Turn left at the very next street, which is East 31st Street. Turn left on Buck Court, then make an immediate right into the parking lot. If you get to St. Clair, you have gone too far.